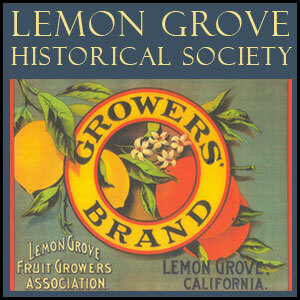 The Lemon Grove Historical Society (LGHS) grew up with the City it serves and is its leading cultural organization. Lemon Grove was incorporated as California’s 414th city in 1977. Its historical society, active informally for many years, was established in 1978 as a 501(c)(3) non-profit corporation. LGHS is governed by a seven-member board of directors with rotating museum docents and various committee chairs. It is a membership organization open to individuals ages eight and over, families and business organizations. The Society’s mission is to research, preserve and share the history of Lemon Grove in a regional/state/national context, to promote interest in the arts and humanities, especially historical studies, and to operate sites and public programs that advance these goals. The Lemon Grove Historical Society is active in the Lemon Grove School District and in many City projects designed to beautify and distinguish the community. LGHS saved the City’s first church, the 1897 First Congregational Church of Christ (also known as the “Atherton Chapel”) and oversaw its adaptive reuse as the Parsonage Museum of Lemon Grove. This Folk Victorian charmer offers two floors of beautiful exhibits related to the civic story. LGHS received a 2001 Governor’s Historic Preservation Award for the rehabilitation of the building. The Society further saved the 1928 H. Lee House, a handsome Tudor Revival mansion, and oversaw its adaptive reuse as the City’s cultural center and as a popular site for social rentals.